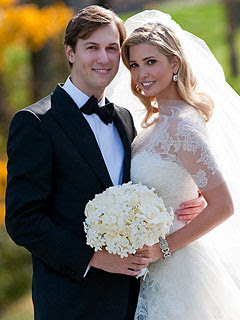 Ivanka Trump married Jared Kushner on Sunday. 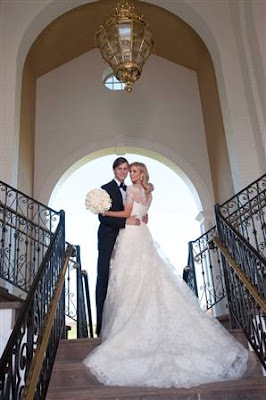 The 27-year-old daughter of real estate mogul Donald Trump and her husband, the publisher of the "New York Observer", had the wedding ceremony at the Trump National Golf Club in Bedminster, New Jersey. Trump wore a Grace Kelly-esque wedding gown from Vera Wang. In attendance were 500 guests including Barbara Walters, Rudy Giuliani, and Russell Crowe. In preparation for the wedding, Ivanka Trump converted from Catholicism to Judaism in July 2009. She has also recently released a book called "The Trump Card: Playing to Win in Work and Life." Donald Trump's toast to the couple was short: "Be happy and enjoy your life." The newlyweds are expected to honeymoon in Africa.